Wonderful weather to be out and about sketching this summer of 2018. Friends introduced me to the area around Grosmont with its beautiful woodland, high places looking over steep valleys and sleepy ravines where the Murk Esk runs over water splashes and into quiet tree-surrounded lagoons. 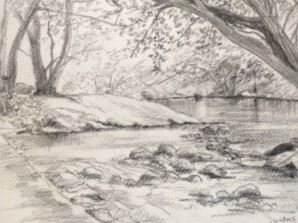 So, several days spent in high summer, all of us enjoying days out sketching, with no rain or high winds to interrupt the work, followed by refreshments at the local friendly cafes. There's more to Grosmont than steam trains(although they're a wonderful sight too).